As a premier Fife INFINITI dealership, we strive to give all our customers a pleasant car-buying experience. We invite all customers looking for new or pre-owned vehicles in Fife to come to our dealership near Bonney Lake. We look forward to seeing you! Feel free to call us at (888) 548-7711if you want to learn more about a specific vehicle. 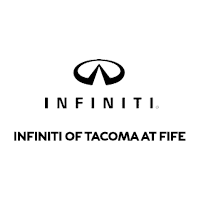 INFINITI of Tacoma at Fife proudly serves Lakewood and Bonney Lake. Drivers continue to prefer us for our large selection of new and pre-owned sedans, SUVs and crossovers. We invite all our customers to search our online inventory. Interested buyers can check out our INFINITI models like Q50 Sedan, Q60 Coupe, Q60 Convertible, QX50 Crossover and QX80 SUVs. Contact us to schedule a test drive today! Our Fife dealership provides various financing options on new and pre-owned vehicles. We also have a dedicated service center and part center. Get a quick quote for your favorite sedan, SUV, crossover or convertible. Our professional staff is here to help you answer any questions. To learn more, stop by our dealership today! If you have any questions about the new and pre-owned vehicles or the parts and services we provide, get in touch with our sales team. An INFINITI of Tacoma at Fife sales representative will get in touch with you and answer all your questions. You can also inquire about our service and parts department. There is a reason why INFINITI of Tacoma at Fife is so popular, and we invite you to come in and see for yourself. We look forward to seeing you soon.